" Mr. D. B. Toye, C.B., O.B.E., LL.D., who passed away on the 9th July 1968, in his 80th year, was C.S.C.U. Treasurer from 1934 to 1946 so his term of office included the difficult war years. Soon after his appointment he presented us with the hymn books which are still in regular use at the London Monthly Meetings at Orange Street Church. His department was the Ministry of Agriculture and Fisheries where he became Principal Assistant Secretary and in which he served until 1945 when he retired due to ill health. He was a barrister at law and became a Governor of the Royal Veterinary College and a member of the River Ouse (Sussex) Catchment Board. His interest in the Union was maintained after his retirement and every year, without fail, we have had the pleasure of hearing from him, including 1952 when he underwent a severe internal operation and in May this year when he admitted to getting rather frail. He had many interests in Christian work; he was a lay reader in the diocese of Southwark as long ago as 1914 and in the diocese of Chichester from 1932. For some years'after his retirement he was Chairman of the Eastbourne Auxiliary of the British and Foreign Bible Society. He passed away suddenly while on holiday and we do sympathise with his wife and daughter in the grief of parting. Let us pray for them that they may know the strength and comfort of the Lord and for ourselves that we may emulate his faithfulness in service for our Lord and Saviour and let us rejoice in the certain hope of resurrection and reunion in our Heavenly Father's home." "Mr. D. Fisher who had been the Union's auditor since 1960 passed away very suddenly on 10th September 1968. "It was a tremendous shock to members of the Department to learn of the sudden death of Doug Fisher at the age of 45. He entered the Civil Service after the war and came to us from the Post Office in 1950: for several years he had been Departmental Representative of the Hospital Saving Association. Doug was essentially a quiet, unassuming man, hard-working, painstaking and thorough in everything he did. Those of us who knew him well and were able to penetrate his reserve soon realised that here was a man of strong Christian beliefs and principles whose life centred around his family and his local church, where he was deeply involved in church affairs and youth leadership. Doug never preached at us but rather put his principles into practice by his example and by showing an overriding concern for people. Nothing was ever too much trouble to him and, at home, what little spare time he had was often devoted to helping those less fortunate than himself. In the office a number of younger members of the Department who came under his care will remember his patience, kindness and helpfulness towards them. Our sympathies go out to his wife and two teenage daughters who, in their great loss and in their hour of need, will not lack help from the many friends Doug made through his own unselfish kindness." The Secretary and Treasurer of C.S.C.U. have written to Mrs. Fisher to express their sympathy, and that of the Union. We can lead another to Christ by the way in which we ourselves found Christ." 20.9.1968: John Lidbetter agreed to continue the Fellowship Letter until someone else was found to take over the ministry. In his new draft, he sought to confront "the present subversive trends". In the December Fellowship Letter (22) he wrote: "A sure knowledge of salvation and firm confidence in the Word of God are essential for our witness". 1.10.1968: Meeting of the Council of the Federation of London Christian Unions. a General Committee had been set up some years ago to deal with the day-to-day running of the federation. Present members: Chairman Edwin Roberts - Secretary A.E. (Bill) White - Treasurer Norman Dellow - Other members: Tom Spicer and R.J. Carter. [All Mr] A.E. (Bill) White had asked to be released from the Secretaryship due to personal reasons. R.J. Carter [Known as "R.J."] of the Accountants Christian fellowship had agreed to become Acting Secretary. In addition to the existing members, Mr Hayes-Allen (London Banks), Miss Muriel E. Walden (Prudential) and Mr Wilson (Insurance and Shipping) were added to the committee. A presentation of £10 and a bookplate recording the presentation were to be made to Bill White "in recognition of his faithful service to the Federation as Secretary over a number of years". It was hoped that Bill would become a Vice-President. He was reluctant to accept any recognition. Eventually (4.1.1975! ), Edwin Roberts wrote "We do, of course, accept your decision regarding the Vice-Presidency". He had left, until the V.P. issue was over, sending the £10 and bookplate "which I have had ready for some time" "as a token of our affection and a reminder of the years of happy fellowship we enjoyed in the Lord's service"
"Most members of the Union will wonder why there has been this long interval with no issue of Service"
Louis Fletcher, who, as Secretary "did so much to resuscitate the Federation after the war"
A.E. (Bill) White, who had succeeded Louis Fletcher as Secretary - Serving until 1968 - He had re-married a few months ago. 1972 was the hundredth anniversary of the formation of the Civil Service Prayer Union. The main commemorations were a Centenary Thanksgiving Service in Westminster (Monday 6.3.1972, below), preceded by a Centenary Conference at Herne Bay Court from Friday 3.6.1972 to Monday 6.3.1972. About 60 attended the conference and 350 people the thanksging service. To encourage branch officers to attend the conference, it was made possible for the fares, too and from London, of two suitable people from each branch to be reimbursed. About half the attenders were active branch leaders. Discussions on the purpose of the CSCU (Saturday 9.45 to 11.00 am), its possibilities (Saturday 5pm to 6pm), its programme (Sunday 10am to 11.30) and its power (Sunday 2pm to 3.15) were recorded (by some means) and a seventeen page typescript of their content prepared. Amongst the issue discussed were the nature of a work-based fellowship of christians, how it related to churches, and what the church is. There were many references to the problems and possibilities arising from a "Christian" union centred on evangelical, bible-based, protestantism, and relations to liberal christians, Roman Catholics and other groups of christians. London members were encouraged to help with accomodation on Monday night, to help people from outside London to attend the thanksgiving service. A "centenary publication", a simple history of the union, was planned - this web history grows out of the preparation for a history that Edwin Roberts made (over many years) in collecting together the archives and making notes on them - His two page history was published in POCA Mail. Journal of the Post Office Christian Association No.338, April-June 1972. This also contained a version of "Communications that Count", a semi-historical survey of the Post Office Christian Association. on MONDAY, 6 MARCH 1972 at 6.30 p.m.
11.7.1972 Death of Ernest Raisey, General Secretary to the The Post Office Christian Association from 1949 to 1962 - Since which he had been Pastor of Elmstead Baptist Church, Chislehurst. For many years chair of the Federation of London Christian Unions and recently a Vice President. 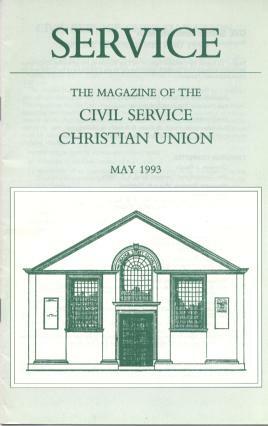 The member societies of the Federation in 1972 were: Accountants Christian Fellowship, BP Christian Fellowship, British Transport Christian Union, Broadcasting Employees' Christian Union, Civil Service Christian Union, Esso Christian Fellowship, Greater London Council Staff Christian Union, Insurance and Shipping Christian Union, Lawyer's Christian Fellowship, Liverpool Victoria Christian Fellowship, London Banks Christian Union, London and manchester Christian Fellowship, London Transport Christian Fellowship, Monday Christian Union - Unilever House, Port of London Christian Fellowship, Post Office Christian Association, Prudential Christian Union, Secretaries' Christian Fellowship, Shell Centre Christian Fellowship, Shell Max Christian Fellowship, Stock Exchange Christian Association. "The only issue of Service in 1971 was that of September/October...So far there has been only one issue in 1972 (February/March)" (Letter 11.7.1972 to The Librarian, Bodleian Library, Oxford)"
Annual Conference 1973: "Mr. Edwin Roberts ... spoke... of his personal disappointment that Service had not appeared regularly." On Thursday 13.9.1973, David G. Marsh, the Grand Master of the Civil Service Catholic Guild, and Edwin Roberts, Hon. Secretary of the Civil Service Christian Union, had lunch together. David Marsh hoped "we will gradually see opportunities for our two bodies to work together and meet together on matters of common interest or concern". An invitation was issued to Edwin, or another member, to attend some Guild activities. In 1946, a lead article in Service had listed materialism, Islam and Roman Catholicism as the main hindrances to reaching the "christless ones" of Africa. In 1959, members of the CSCU successfully protested at the Roman Catholic Church being allowed to advertise in a civil service trade union journal. But the protest was moderated by the Committee and was not made official. A few Catholics became active in the union, holding office at branch level, attending services, and sometimes writing letters of protest about anti- Catholic statements in Service. However, from the beginning of his secretaryship, Edwin Roberts had an explicit editorial policy of removing or moderating criticisms of Roman Catholicism from material submitted for publication, so occasions for protest were not frequent. The Civil Service Catholic Guild was founded in 1933, the year of the CSCU's Diamond Jubilee. It sought "to enable Roman Catholic civil servants to meet each other socially, to cater for their spiritual welfare and to foster an enlightened catholic outlook on public administration. Since the Second Vatican Council, the Guild has increasingly sought to provide opportunities for its members to up-date their knowledge of the Christian faith". Service cost the union £110 for the September 1973 issue, compared with £82 for the September 1972 issue. Stanley Hunt printers advised that a major reason for rising cost was that they could not print "isolated issues" for the same rate as four issues a year. After the barren year of 1975 one issue of the magazine was produced in 1976 (1976 Annual Report). An obituary for Dorothy Eleanor Combe, who died 26.2.1976 was published in the September 1977 issue. Promises Fulfilled by Eunice Diment. A Bible translator in the Philippines, on the C.S.C.U. Missionary list, Eunice Diment was kidnapped for three weeks by armed guerillas early in 1976. Paternoster Press published her account Kidnapped and she spoke at the C.S.C.U. Weekend Conference in November 1976. Worth Your Support by Philip Elliot, OBE, is taken from a paper prepared for delivery at a lunch-hour meeting of the Post Office Christian Association at Camelford House, Albert Embankment, on 3.4.1974. The original title was "The importance of an Office Christian Fellowship" and it recounts the value of the Civil Service Christian Union to Philip Elliot from when he joined in 1910. 19.10.1977 A letter to D.H. Thornton c/o London City Mission gave some of the recent history of the Federation of London Christian Unions. Philip Henman had been President for some years. The Federation had 19 constituent Unions, listed on its Prayer Card. "Our main activity for some time has been the convening of the Annual Rally which serves as a focal point for fellowship between different Unions." "For many years a weekly lunch-time service was held in St Mary Woolnoth Church... but this is no longer held..." Council meetings are held once or twice a year. "There was something of a 'trough' in our work a few years ago, but this has now receded." November 1978: Cardiff Branch closes after twenty five (and a half) years. Mr M.R. Turner was the only person on the committee throughout - Serving as assistant treasurer and treasurer - even though "I was never more than a temporary technical civil servant, and left the Service two years after the Branch was formed". A short history was prepared by David K. Rutter of the Greater London Council Staff Christian Union, for the celebrations in November. He was able to use Council minutes going back to 1947. "After a regretted hiatus in the issue of the magazine it is now hoped, and indeed expected, that Service will appear more regularly"
3.11.1981 from a member DHSS Torquay: "Dear Mr Timms, I joined the CSCU on 12.1.1981 but as yet have not received any copies of Service magazine. Has publication ceased? Yours in Christ ...."
"Dear Eddie. I think only you can answer this one! Please do. John T. 8.11.1981. 10 Meadway Crescent, Hove, Sussex"
At about the time of the 75th Anniversary, R.J. Carter and Edwin Roberts ceased to be (Acting) Secretary and Chairman (both continued on the committee) and their places were taken by John M. Barnes (Secretary) and Tom Spicer (Chairman). John Barnes introduced a quarterly newsletter. The first preserved (in this collection) is "No.3 December 1980". ... "8.1 Some will hold that they should not speak in any way in meetings of a church, when men are present. 8.2 Some will say that they should not hold positions of authority, with responsibility for the doctrine of the church, and should not 'teach' or preach but may read the scriptures, lead in prayer, take part in discussion etc. 8.3 Some will say that such restrictions have no part in the New Testament church and ladies are as free as men to exercise all the functions of the church. 8.4 All will point to parts of Scripture which they believe support their convictions." "...10 Some suggested guidelines are: 10.1 a CU is a place where all believers meet on common ground and not within the 'rules' and organisation of any particular local church. 10.2 it is therefore open to all present, men or ladies, to take part in its life and fellowship, to act as officers, and to take part in its meetings. 10.3 This may include taking the chair at meetings and leading Bible studies etc, as well as taking part in discussion. 10.4. ... one should avoid speakers whose extreme views or their way of delivering them will offend or disparage those with a narrower view. 10.6 where there are members who feel strongly that women should be silent or not take the lead, the officers may find it wise to discuss the position graciously with them... 11 Our aim should be: In things essential - united. In other things - tolerant. In all things - gracious." "...the expected improvement in magazine issue and fellowship letters was not realised..."
The September 1982 issue has features about the history of the union. Mr G. Ritchie Rice, a vice-President who was 100 in July 1981, provided an article that looked backwards, around and forward. The backwards look gives a picture of the Civil Service when he joined it in October 1899. Mr Rice had died on 14.2.1982. His article is followed by a short history of the union by Frederick Tatford. Minutes of Committee Meeting at 1 Victoria Street 21.2.1984. Minutes of Committee Meeting at 1 Victoria Street 9.10.1984. "It was noted that Mrs Grace Bedder (formerly Miss Grace Gates) had relinquished her post as Assistant Secretary, which she had held since 1951, as from the 1984 Annual Meeting. During this time she had been responsible for the addressing of envelopes for the Union's magazines, notices and circulars"
14.6.1986: Dr Frederick A. Tatford, a Vice-President of the Union with a long record of service, "notably as Editor of the magazine from 1923" [incorrect] to 1950, died very suddenly at the age of 85. May 1987 Proposed Amended Rules. "some much-needed revision... to bring them more into line with modern and changed circumstances and to facilitate inclusion in the Register of Charities". Thursday 14.5.1987 Orange Street: Special Conference to consider and approve proposals for revision of the Union rules. Followed by the Annual Conference. At 6.15. Refreshments from 5.15. Hope you will give same support to Tony. Rule amendment proposals were submitted to a Special Conference at Sunbury Court on 27.9.1987 - but were not accepted. "This issue of Service, the first after a long break which we all regret but could be avoided, marks the beginning of a new episode in the Union's life. A new Secretary has taken over responsibility and will need the support and prayers of all." The Revd. A.E. Hardy has been appointed Hon. Secretary of the Civil Service Christian Union, which has branches over a wide are of the United Kingdom. A full-time civil servant himself, Mr Hardy has been ordained as a non- stipendiary minister in the Church of England, serving in his own office and also assisting in his parish church. He has been an active member of the Union for a long time. It is hoped that the new appointment will open the way for wider and more effective development of the Union's ministry, which began in 1872 and is as important as ever. The Press Release does not have a date. It adds Rev. A.E. Hardy's address for correspondence. Some branches send in a sum of money with no list of members while others do not send regularly so we cannot get an accurate count of members. The known totals are 255 serving members and 95 retired members and the overall total is perhaps 450-500. This is less than one per thousand Civil Servants..."
1995 was again a disappointing year with more Branches closing or ceasing to meet. One issue of Service was produced in July with a Directory of Branches and details of the Annual Meeting for 1995 and Reports and Accounts for 1994. the Rules with the proposed changes for the special General Meeting were also included. General articles and Branch Reports were published in the Newsletters. The number of individual paid-up members fell to just under 300 (1994 340). The number of Branches fell as six closed and three became linked fellowships. There was a financial surplus for the year of £1,169. Central London Meetings were held quarterly in Orange Street Church but with a smaller regular attendance. This edition includes the Rules adopted 14.9.1995, The Missionary Fund Report for 1995, and a directory of branches and secretaries. "Thank you for your letter about the future of the Civil Service Christian Union. I joined CSCU in 1957 and have been active in it ever since so you will understand how much I value its work and object. I am very pleased to tell you that the Special General Meeting accepted the proposed changes to the Rules. The changes will make a significant reduction in the administrative work for we shall no longer have Branches and Members but linked Fellowships and individuals. CSCU will continue but in a rather different form. There is of course some sadness at the changes but as few Christians in the Civil Service were prepared to support as Members and none to take over the burdens of office it was that or close. CSCU will become the focus of an informal network enabling Christians in the Civil Service to get in touch with one another. We shall prepare a mailing list and provide copies to all fellowships and individuals listed. At first this will be incomplete as there are many gaps in the information held centrally. The names and addresses of retired members will be held on a separate list and given only to retired members. We are aware of a few networks which have recently come into being. There is one in the Customs and Excise Dept and another in the Westminster area of London. just as they have come to value "networking" so we have come to see it as the way for the future. Please pray for your Executive Committee as they move forward in faith. No date, but about 1918: History of Orange Street Chapel, Leicester Square, W.C. By the Rev. Isaac Harthill, F.R.G.S. Fourpence. The date does not include a year. The years have been calculated from the dates that fell on Thursday. Assembly Hall, Mary Summer House, Tufton Street, London, SW1. Speaker: Dr. J.E. Richardson, Ph.D. President of the National Young Life Campaign. Thursday 14th June  Lt-Gen. Sir Arthur Smith K.C.B., K.B.E., D.S.O., M.C. Thursday 8th November  London Endeavour Choir, Conductor - Mr E.T. Shepherd. Thursday 13th December  "Fact and Faith" Film "Dust or Destiny"
Speaker: Rev. Alan Redpath, A.C.A. Members of the London Endeavour Choir will sing. Thursday 8th January  Rev. E.H. Worstead, B.A., B.D., Senior Tutor. Spurgeon's College. Thursday 13th August  Mr. Arnold J. Clarke, Missionary in China until his imprisonment by the Chinese in 1951. Thursday 10th September  The Rev. Canon A.S. Giles, C.B.E., M.A., Q.H.C. Chaplain-in-Chief to the Royal Air Force. Thursday 10th June  Mr. John Heaton, of the Ministry of Pensions and National Insurance. Initially, the Civil Service Prayer Union was an agreement to pray. From the 1890s to the present day, however, the Civil Service Prayer Unions and Christian Unions laid down items of belief that qualified a person for membership. These tests, or membership qualifications, have played an important part in the history of the Union, and have sometimes been the centre of debate. Their core has remained the same since 1893, but they were narrowed in the 1940s when a (possibly ambiguous) clause requiring "belief in the Holy Scriptures" was added. The structure of the union, as well as the tests of membership, affected the breadth of opinion reflected within the Union. Prior to the first world war, for example, the structure of the Union provided for a very wide debate outside the test of membership because the Junior Civil Service Christian Union encouraged non-members to buy and contribute to is paper and to attend and participate in the debates at its meetings, although not to vote. The tests have been strictest since the second world war because of the (possibly) fundamentalist clause about the scriptures. Drafts for this clause were unambiguously fundamentalist. The version adopted was the softest. The interpretation and application of the tests has affected the breadth of debate. After the adoption of the scripture clause, for example, the union still sought to relate to Christian Fellowships within the Civil Service with a broader basis. In the 1950s the affairs of such fellowships were reported in Service "as if" they were branches. The "tests" often deterred their affiliation for several years, but active fellowship with the Union sometimes led to their position being "regularised". This diversity of branch philosophy and practice meant that a broader discussion of issues took place in some branches than in others. One large branch, for example, was sufficiently unified in its membership to annually hold communion (the breaking of bread and tasting of wine) in the manner of the Christian Brethren. Other branches were of a sufficiently broad outlook to hold series of meetings at which views of different religions, denominations and sects were discussed with members of those groups. In addition to the written tests, however, there were unwritten tests for many members of the Union. The tests do not appear, for example, to exclude Roman Catholics and (in fact) some branches included Catholics. There was however a strongly anti-Catholic tradition within the Union. The strains over this issue, after about 1970, between the anti-Catholic and the Catholic accepting members of the Union are evident in letters between Union members, but the debate was not reported in Service. Civil Service Prayer Union Calendar of Prayer and List of Members for 1872 states that "the only essential condition of membership" is the "agreement" of "members in private prayer one morning in the week for the Civil Service and for one another". Previous prayer lists do not state an "essential condition" of membership. (a) belief in the Holy Trinity of God the Father, God the Son, and God the Holy Spirit. (b) personal trust in the efficacy of the atoning work of the Lord Jesus Christ our Saviour. Rules of the Civil Service Christian Union for Prayer and the furtherance of the kingdom of God. George Lane's "Revised proof 25.11.1931". It was proposed by Miss J.M. Burton (Ministry of Health) and seconded by Mr Hawkins that an addition should be made to the effect that a belief in the inspiration and inerrancy of the Scriptures is required." It was proposed by Mr Tatford and seconded by Mr Elliot that a motion be put from the Chairman that Rule 3.1.c of the Constitution be amended by the deletion of the words "inspiration and inerrancy of the". Minutes of the Annual Conference held in the Assembly Room, Central Hall, Westminster on Tuesday 11.2.1947: The proposed amendment was put, and the reasons for explained, and after brief discussion, carried unanimously. There about 200 members and friends present at this meeting. Reasons and discussions are not recorded in the minutes or in Service. The following account was given in a letter of 12.5.1955 from Edwin Roberts to Douglas Robertson, an enquirer who had questioned the vagueness of the expression "belief in the Holy Scriptures". "When or present rules were drafted in 1946 the expression "belief in the inspiration and inerrancy of the Holy Scriptures" was inserted in consequence of an amendment moved at the Special General Meeting. About two years later, however, [actually, 3 months later] the words [inspiration and inerrancy of the] were deleted by a resolution at the Annual Conference, because they had given rise to difficulty of interpretation. Some people believe that the Authorised Version of the Bible is 100% accurate in every respect; some people believe that while the writers of the Scriptures were preserved from error in matters of doctrine they were not necessarily preserved from error in minor historical and scientific matters. The Committee of the time (all of whom were fundamentalists) felt that it would not be right to exclude from membership people of the last viewpoint and also saw the difficulty of interpreting the phrase, and therefore supported the change. I was on the Committee at the time and can testify that there was no question of any member having any doubt that "God spake all these things". My own firm view is that the Union's evangelical position cannot be safeguarded by mere words in the Rules. Its safety lies in the fact that the members of the Union are, in fact, fundamentalists and are determined to keep it thus. The basis of faith serves the position [purpose?] of declaring our position in simple language and if you read the first two clauses carefully you will realise that we have nothing to fear in that respect from people who have honestly signed their agreement to them. I don't know what your own denominational affiliation is, but I suggest that you look at the names inside the cover of Service and you may recognise some of them." (c) belief in the Holy Scriptures." conditions of membership from 1872 to the present.